Photo of French surfer Margaux Arramon-Tucoo by Kassia Meador via The Swallowtail Society. 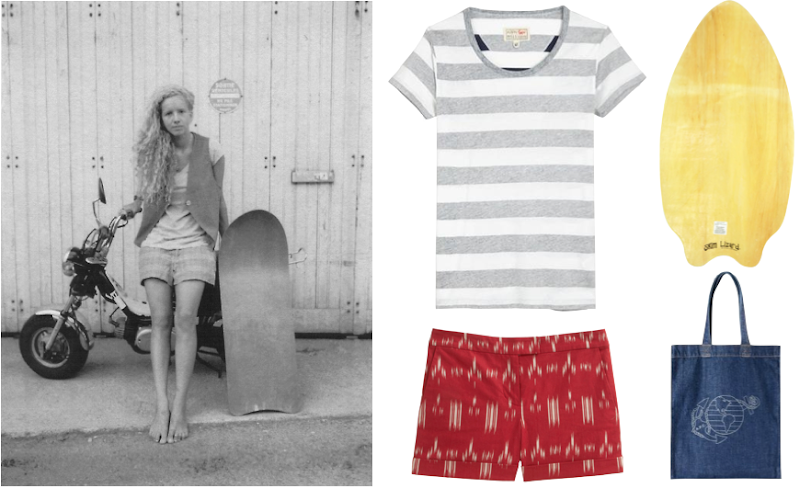 Lymore Tee ($56); Skimboard; A.P.C. Anchor Denim Bag ($25); 10 Crosby Ikat Shorts ($225). the ikat shorts are beautiful. Margaux is quickly becoming my favorite girls name, it seems to be attached to the most beautiful, free-spririted women! i discovered your blog over the weekend, and am totally hooked. i am very much so looking forward to the book coming out! what an incredible free and wanton spirit; great inspiration for my sometimes overbearing pragmatism. Don't forget to mention the cute bracelet she is wearing from The Keep A Breast Foundation. Margaux and the Photographer Kassia Meador are Keep A Breast Foundation ambassadors and love to wear these fabric bracelets from the organizations cause merchandise line! So Cute! Aren't most tomboys practical? I agree with investment pieces, but $225 shorts?? That's hi-larious.